I don't know but I recognise the door behind Nana and the picture on the wall as Vinal Ave. I'm assuming that the snapshot was taken around your time at Nana's, not mine. By the time I got there she was much older looking and not entertaining or not giving teas anymore. I think this was an earlier photo taken before we even moved to Mass from NH.... I think this because... as you said she looks very young in this pic. I remember her looking like this when she lived in Newton... 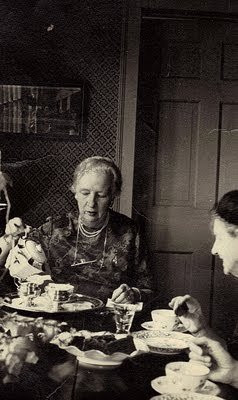 The other lady might be her friend Mrs. Townsend who lived next door in Newton. I cannot be sure. Definitely Vinal Ave... That picture of The Last Supper hung on the wall behind Nana's seat at the dinner table, the seat by her bedroom door. Which would explain why the door is closed and why there is a reflection in the picture. The reflection is from the window by the table that looked onto the cemetery. The table looked into the cemetery ...? Why? Great picture of your Nana.